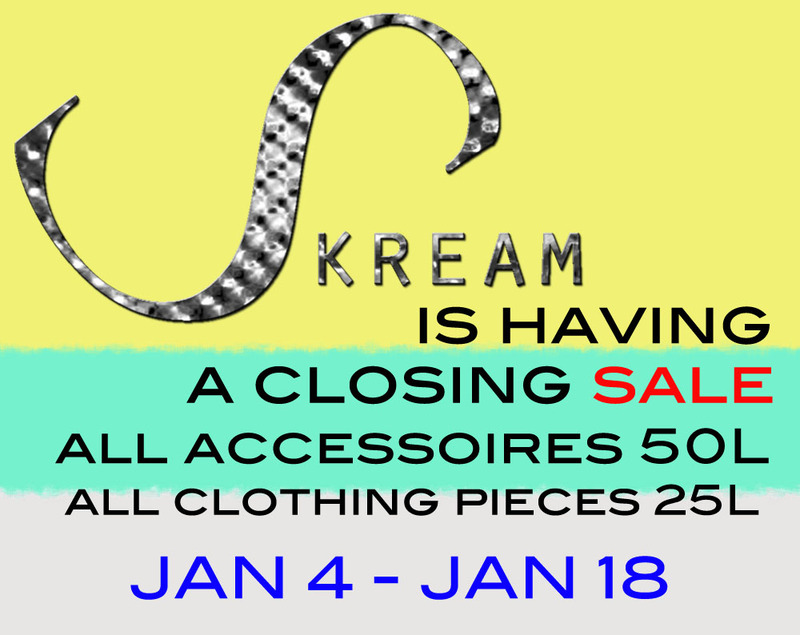 Skream will be discontinuing ALL items on January 18th, 2011 – we are not sure when Skream will be back… BUT there is a closing sale from January 4th-18th. So come on by Skream before all the items go off the racks!!! Merry Christmas to all those who celebrate it ! * You must be wearing at least 3 items from Skream. 3. On each of the photographs, please label it as your FULL SECOND LIFE NAME. 6. Now teleport to Skream, and drop your notecard in the mailbox in the entrance of the store! *If you have any questions please drop Jacqueline Cliassi a comprehensive notecard. ❤ please&thank you. So… Skream has a new dress! Step ONE: You gain some lindens via work or CC. Step TWO: You go to the internet and scope out some blogs. Step THREE: You TP to a few stores. Step FOUR: You are now BROKE. Guess what? You need fashion rehab. And what is the best way to fix this? Well iSL? Take time off to buy something cheap! Fashion Rehabilitation is a monthly, month long event. Each month, there will be a theme, and on the first of each month, the designers will put out one or more items that go with the theme on SALE until the end of the month, and so on and so forth. These items may be exclusive or available after the event, but will no longer be on sale! The list for the last Fashion Rehabilitation! !